After a crazy week of excess and extravagance at the school, my boys had become completely obsessed with what they were getting, what they were eating, and what they were doing to celebrate Christmas. The consumerism had taken over and I was finding that I was repeatedly trying to get the boys to reel in what Christmas is really about. Now don’t get me wrong I am all for a fun week of celebration at school leading up to Christmas break but I wanted to make sure as a family we kept a little perspective. Over the last few weeks I have been broken and blessed. I almost feel like I have had a schizophrenic holiday season. I have seen unimaginable suffering first hand in my role as a nurse and my newsfeed has been flooded with inspirational stories of giving. I have witnessed true giving with my Operation Snowflake ministry and seen complete selfishness and disregard from people I do life with. I have seen the best of people and been shaken by what I think is the worst in people. The need to refocus myself and my boys with what Christmas means to OUR home became paramount. 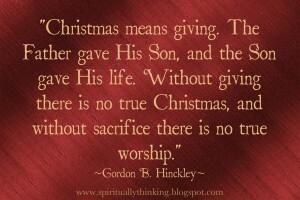 I realized that the best way for ME to remember what Christmas is all about is to surround myself with giving. As a mother of two boys I feel a strong responsibility to show them that giving is way more important than receiving. I want them to understand what was given to them on Christmas Day all those years ago. 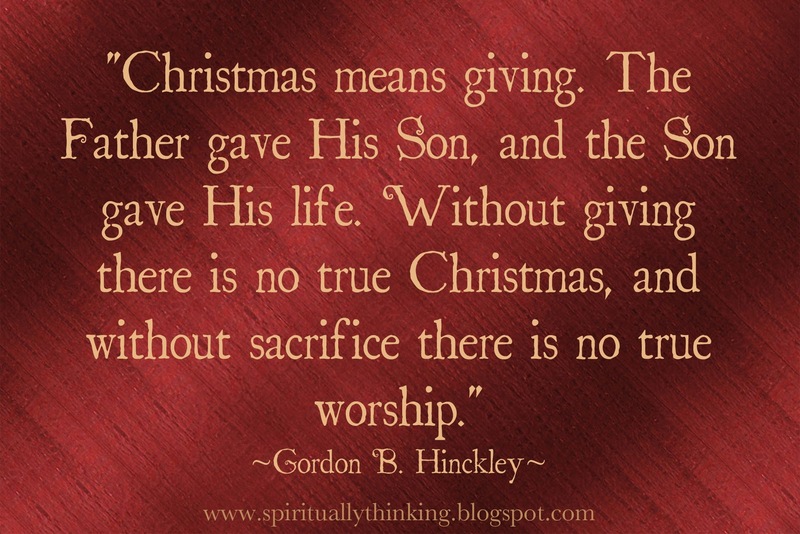 When they think of Christmas I want them to first think of God’s sacrifice on that day. Doug and I know that giving is our favorite part of the season, but how do you show that to a nine and six year old boy? 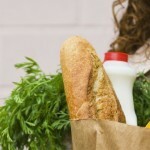 How do you help them “feel” that feeling you get when you give? The way I became passionate about giving was I first needed to learn how to give. So there lied the challenge! How was I going to teach my boys what it meant to give? I wanted my boys to FEEL it. Really FEEL it and not just go through the motions. When they got in the car I told them to buckle up because we were going to have a little fun! That immediately got their attention and I began to tell them about the Giving Adventure. I explained that I had filled out two cards. 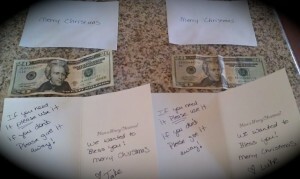 One card from Jake and one card from Luke. Inside each card was $20 and a note that read, “We wanted to Bless you! If you need this Please spend it and if you don’t Please give it away.” I instructed the boys that while out on our errands they would get to choose who would receive the giving cards. I asked them to pray to God for guidance on how to fulfill this VERY important task. They both shut their eyes and “prayed”. When we were done praying Luke, my six year old asked, “Mama how will I know” and I reassured him that he will know. So off we went. We made several stops and it was so cute to see how nervous they were. They are very generous children but I could tell they felt a huge amount of responsibility. Jake didn’t want to hold the card and he stayed right by my side. Luke stared at everyone as if waiting for a sign. I constantly reassured them and made suggestions on people I thought might be good choices. All my suggestions were shot down. After making at least three stops we got back in the car and Jake followed by Luke exclaimed I know who I want to give my card to. Jake said, “I want to give my card to my friend Jon” I was surprised and asked why, knowing that Jon was not in need. Jake responded, “because he is MY friend and it would make him happy”. Luke then responded, “ I want to give my card to MY friend Jack!” Same situation here, Jack was not needy but Jack is one of Luke’s very best friends. Luke said, “Jack can buy some nice things to play with”. So off we went to Jon and Jack’s house. To be honest the whole way I was trying to figure out what I was going to tell their parents. I asked Luke if he wanted to get out and explain the card to Jack and he said, “NO!” Evidently he did not want Jack to know it was from him. He wanted it to be a surprise. When we arrived at Jack’s I got out, rang the doorbell, and explained to his mom what we were doing there. She graciously took the card, called for Jack, and invited us in. I had to refuse because Luke wanted it to be a surprise. We both laughed and when I got back in the car the boys were smiling from ear to ear. Next we were off to Jon’s. Jake felt differently, he wanted to deliver the card to Jon and explain what it was for. When we arrived at Jon’s house we all got out and went to the door. Jon’s sister answered the door and Jake asked if Jon was there. She invited us in and Jake walked right up to Jon, explained why we were there, handed him the card and then stood back. Jon smiled big, opened the card and said, “WOW! Thanks Jake!” Jake immediately turned the darkest shade of red you have ever seen. Jon’s sister then read the card out loud. 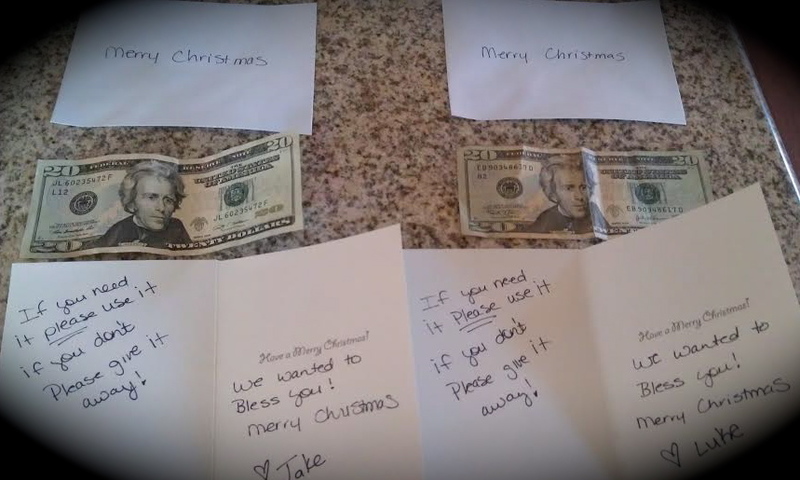 Jake said you can keep the money if you need it or if you don’t you can give it to someone who does. Jon immediately responded, “I don’t need it, I want to give it to my cousin!” (Jon is 8) All four of the kids stood there with BIG smiles. As we drove home my boys were giddy. They were chatting in the back seat about how fun it was and that we should do that again! I of course listened quietly with tears running down my cheeks. I knew that they FELT it. I also realized at that moment that of course they would give to those they love first because that is how we all learn to give. In Luke 2 God gave us His son. We were not strangers we were and are the most important people in HIS life. When every thing was said and done and we were back home I realized that not only did my children give as God led them but he gave them the Joy in their heart. They have spoken several times in the last few days of the Giving Adventure and asked if we can do it again. Jake said maybe this time he could give a card to a stranger. Success!